Twenty-eight UD students presented research posters at the Undergraduate Research Symposium in the Chemical and Biological Sciences at the University of Maryland, Baltimore County, on Oct. 22. 4:54 p.m., Oct. 25, 2011--The University of Delaware was well represented at the 14th annual Undergraduate Research Symposium in the Chemical and Biological Sciences, held Saturday, Oct. 22, at the University of Maryland, Baltimore County. More than 200 students from 40 schools competed for awards in 35 judging groups at the symposium. 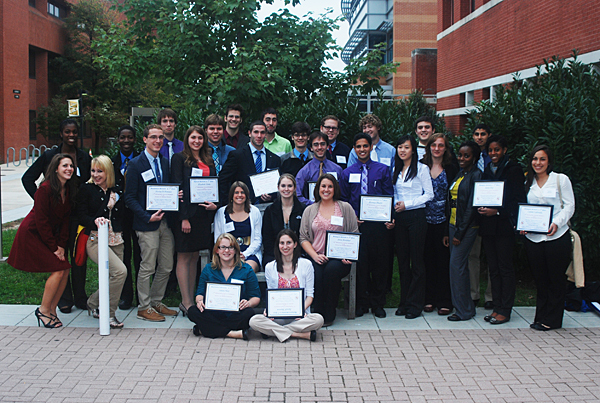 UD students received first-place awards in 11 groups, more than half of the groups in which they competed. Of the 28 UD students who presented research posters at the symposium, 11 received first-place awards, and three students received second-place awards. • Josh Wallace, Biology Group 3a, Kathleen Schell and William Rose. • Kara Martin, Chemistry Group 1b, Neal Zondlo. • Christopher Wright, Biochemistry, Pamela Green. Accompanying the students to the symposium was Hal White, professor of chemistry and biochemistry and director of the UD Howard Hughes Medical Institute's Undergraduate Science Education Program, which sponsored the trip.